"Emily, Team Odyssey might need a 4th for Wild and Wonderful this weekend. Interested? We should know today if Jen can't make it. Race fee is all paid so you just have to get to New River Gorge..."
The "Wild and Wonderful" he's referring to is a 24 hour adventure race in the New River Gorge area of West Virginia. It's directed by Ronny Angell of Odyssey Adventure Racing, and staged out of ACE Adventure Resort. It's a race I've been wanting to do ever since visiting this area in 2012 for Checkpoint Tracker National Championships, a course designed by Mark and directed by Ronny. 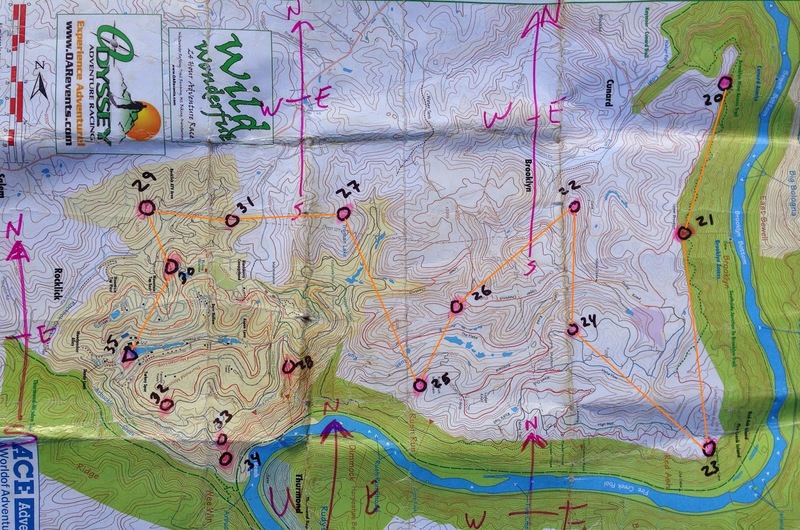 This part of West Virginia has very challenging terrain, and Odyssey puts on very high quality events. Mark and his teammates are very experienced, fast, and friendly racers. Did I mention the race starts with 2 hours of Class III-V whitewater rafting on the New River? The only bugger was travel - it's an easy but long 8hr drive from St. Louis to Oak Hill, and I'd need to move some work commitments around. So the next 24 hours were filled with emails and phone calls and we eventually figured out that I was able to race! So exciting! Almost there! Ready for some Wild and Wonderful adventure racing! So I loaded up my iPod with listening material and made the drive over to Oak Hill on Friday. I actually listened to the TA1 podcast that Mark did with Legendary Randy Ericksen and called it "team research". There are also tons of country music stations all throughout Kentucky and, judge me if you will, I love country music. So I was a pretty happy girl until Frankfort, KY, where I'd planned to stop and ride some singletrack...I mean "off-track bicycle trail"... at Capitol View Park, but it was raining, so I just kept on driving. I rolled into Oak Hill pretty much on time, and met Mark in his Sprinter van for some pizza, tea, and chat before Andy and Shane arrived. Andy declares victory over DC traffic. Shane agrees. Eventually the boys made it to ACE (also with Kristen from TeamSOG, I mean TOG. Side note: this is what adventure racing is all about - carpooling with your toughest competitors!) and we proceeded to piddle around with bikes before the race meeting. Since I don't make it out to the East Cost area very much, I don't know hardly any of the racers here, but it's really cool to see the adventure racing community alive and well. Sure, there are a few faces I recognize from one of the Nationalses last year, but for the most part I feel anonymous which is awesome. What is not awesome, though, is the Oak Hill weather - cold and drizzly. The forecast is not predicting much improvement for race day, which will make staying warm overnight a challenge. We also learn that recent rains have put the New River above flood stage, making it unsafe for commercial paddling. We're not sure what Ronny plans to do about the start of the race now, but we do know that with the rafting being cancelled, we'll be on our feet and bikes a whole lot tomorrow. We're clearly up to no good. Mark, me, Andy, Shane. We attend the pre-race meeting and it's nothing unexpected. Ronny announces that we will be given maps in the morning, and be bussed to the start. There is a vague course overview but really, we just need to show up with all of our gear/water/food for the next 24hrs. So with that, we check into our hotel/motel and mess around with gear until it's time for bed. What, you don't see the girls bathroom sign? When we arrive back at ACE in the morning, we learn that Ronny has decided to bus us to the original paddle take-out, and start the race from there with a short LeMans run to CP1 and then a quick TA onto bikes. So we plot maps, waterproof them, load busses, and strategize on the ride down to the New River bank, which requires the bus to make a few three-point turns to negotiate the switchbacks. Love it! Once we unload, me and a few other girls declare a random pick-up truck as the girls' bathroom and all pee. Bonding! We also get a good look at the New River and....dang. It would have been very scary and probably very fun to raft that. But it's also nice to be alive. So Ronny counts us down and it's time to race! There isn't much to this first leg. We run uphill a ways, get the punch, and the run downhill a few hundred meters and transition onto our bikes. Biking from CP1 to CP2. We get everyone into their bike shoes, under their helmets, and onto their bikes and pedal our way out of the New River Gorge. I think TOG (3-person coed) is already in front, and GOALS (2-person male) is right ahead of us and we can see them as we ride the singletrack up the western side of the gorge. 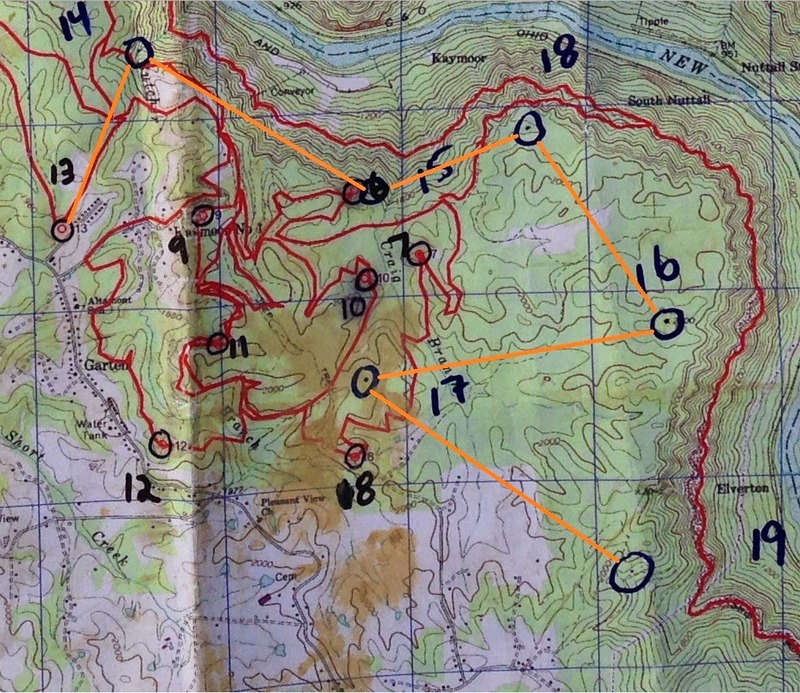 Mark knows these trails really well and is surprised when GOALS takes the same (unmapped) shortcut he was planning. So we all ride into CP2 together, and see TOG just leaving the area on foot. We quickly transition, and I take Mark's mandatory gear so we only have three packs between us. Fun! The second trek. 2-4-5 and then return to 2. Before the race started, Ronny threw out CP3, so we only had to go to CPs 4 and 5 before returning back to our bikes. We run through the town of Fayetteville with TOG and GOALS leading the charge. I'm feeling just about as good as can be expected for a slow starter like me, and the boys all seem happy with the pace. Yes. I navved the whole thing. NOT! Since the urban-style nav is pretty easy, we goof around a little bit to pass the time between CPs on the outbound leg. On the way back, we get to cheer for a lot of other teams, and then Mark takes my pack for the last 1k. What a difference it makes! I feel amazing now! To me, that really highlights two things: a) the large effect that 10 extra pounds has on my pace, and b) I need to log more training hours with a pack. Noted. We run back into TA just on the heels of GOALS, excited to continue putting Mark's trail knowledge to use for the next leg. The first part of the bike - left CP2/TA and rode to the Arrowhead trail system. Our next route is to punch 6-7-8 in order, and then we can get 9-13 any way we chooise (aka rogaine style). So we use some singletrack connectors to get into the Arrowhead trail system which is pretty great. We think we've made up some time on TOG as we punch CP6, and then even more time on the attack to CP7. 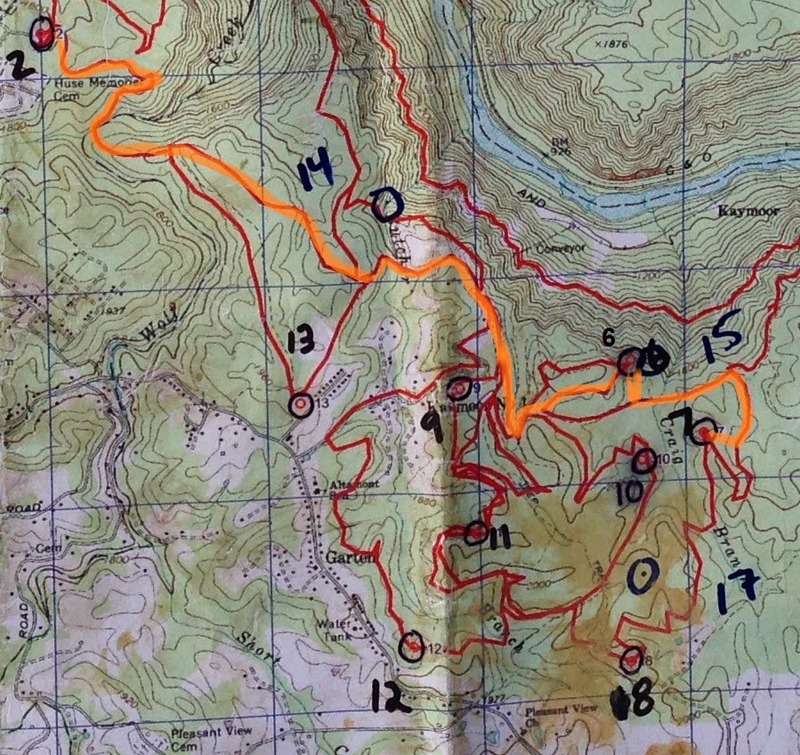 Our plan is to bikewhack across a switchback (see map) and then land directly at 7 for the punch. Mark leads us into the really open woods (almost ridable, they were so open) and I'm last of the bunch. About a hundred meters into the woods, I see something that is really, really not good - Mark on the ground, grabbing his leg, with Andy and Shane standing by him looking concerned. Something is definitely up, and in my mind I rule out cramps because it's early in the race and Mark is pretty experienced with managing nutrition/hydration/effort, so I figure it's a snakebite. This all happens in the few seconds it takes me to catch up with the boys. Once I get there, Shane says, "Get out your phone and call 911." This is bad!! As I'm digging my phone out (yes, the SAME ONE I was grateful to be carrying at the BRAWL), I take in the situation. Mark has a stick in his leg. As in he is impaled on a stick. As in he walked into a stick and it skewered his calf. As in he is a human shish-ka-bob. And it does not look comfortable. In one side, almost out the other. I get ahold of 911 and hand the phone to Shane, who is a former paramedic, to talk medical to EMS while Andy and I try to comfort Mark. There is very little blood, which is surprising to me, but evidently the stick's wedged in there pretty good. Mark even threatens to pull it out and continue racing, but Shane pulls rank and denies that request. We strategize how to get Mark out to the trailhead parking lot where the ambulance is going to meet us, and it turns out that he wants to use his bike as a crutch to hop back through the woods to the trail we attacked from. But before we leave, Mark is sure to tell Andy to "go get CP7 while we're this close anyway". So Andy goes and punches CP7 as the rest of us bikewhack back through the woods. Surprisingly, or perhaps not surprisingly to those people who know Mark, he's really fast at this. Faster than I am with no sticks in either of my legs. Amazing. Apologies on the orientation of this photograph. Blogger dislike. We make it back to the gravel doubletrack, and my phone rings again. It's EMS. "Is this the guy who was biking and got a stick in his leg?" Yes, yes it is. They are asking for more specific directions to the trailhead that I cannot give them. So, logically, I hand the phone to the actual guy with the stick in his leg, and Mark responds beautifully, chatting with the EMS folks and giving them perfect directions. A horrible situation, for sure, but definitely one of my favorite race moments this year! Andy bikes ahead to fetch the ambulance, and pretty soon it's trundling down the gravel with the Park Ranger right behind. We load Mark up, making sure he's got his pack with calories and water, none of the mandatory team gear, and at the last minute I grab his race camera so we can document the rest of our day. It wasn't much of a discussion that the 3 of us would continue. Mark even cheers us on to go after TOG and GOALS. We wish him the best medical care possible, and then re-mount our bikes for the remaining CPs. Given our current location, we have to ride right past CP10 on our way to get CP8, which is a slight bummer but race rules are race rules. Andy's taken over the maps which isn't that far-fetched because I'm told he does a lot of co-navigation with Mark anyway, and I completely trust his leadership. 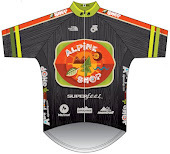 I have a hard time getting back into race mode, and am not especially speedy on the singletrack. It's hard to endure such emotional swings like that. Teammates are teammates, regardless of how long we've known each other, and it's difficult to see one of us injured. We work our way through the remainder of the singletrack (8-10-9-12-13) and by the time we get to TA/CP13, we're back on a roll. Sure, we've lost a bunch of time and positions, but a lot can happen in 24 hours and we aim to make the most of our Wild Wonderful race! It's fun in TA because the boys are plotting (something I normally do for Alpine Shop) so I get to do the "other" TA tasks, like switching everyone's shoes, packing up bikes, getting food out, etc. I notice one of my hair ties has gone missing but a race volunteer gives me hers - it's the little things that mean the most! Thank you! The bikes get loaded up for transport back to Race HQ and we are staring at a looooooooong trekking leg. Honestly, I couldn't be happier because I have been lacking in time-on-feet-with-pack recently so this will help my trekking toughness a lot. Ronny is not making it easy on us, either, it takes three pairs of eyes on the map to determine the "best" route. We settle on 14-15-18-16-17-19 and run out of TA. Here beginnith mid-race selfies! Mark's got an old-school camera WITHOUT a rear-facing lens so this shows some real skill on my part. We are in the mix with the Halfway There/Spokes, Etc, but they find a better way through the rhodo to CP15 and we are by ourselves again. Then we have some trouble with CP18, located in a shallow reentrant that we attacked too late. While we're relocating, we run into Rafael, aka Lone Wolf, who's racing solo male. Andy and Rafael work together to find our subtle reentrant and boom, there's the flag! Awesome! The four of us end up staying together for 16 and 17 too, and we both use the road route to CP19, since we are all running a bit low on water and are hoping to find a house with a hose. It's always exciting meeting non-adventure racers during a race, since we usually look all crazy (in spandex and very dirty) and unexpected. But, almost unfailingly, people are so kind. This time it's no different - we find a man with a hose and a beautiful, fierce Rottweiler. The four of us all fill up, say thank you, and hit the road running. 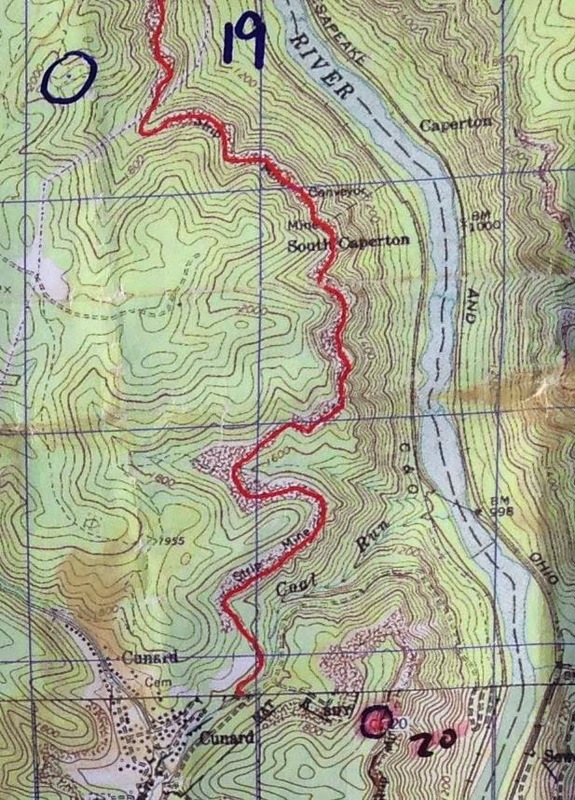 After we hit CP19, it's down to the red trail (I don't know the name but it contours quite nicely along the New River Gorge) for some more easy trail running. Everyone's feeling pretty good at this point, and we're able to keep a great pace all the way to CP20. I think CP20 is the one where we had to climb a cliff to check a code stamped on a utility pole. By this time we'd caught another team in front of us (Race Day Rush, but we just called them "The Canadians"...because that's where they're from, eh?) so now we've got a 3-team convergence on the pole. 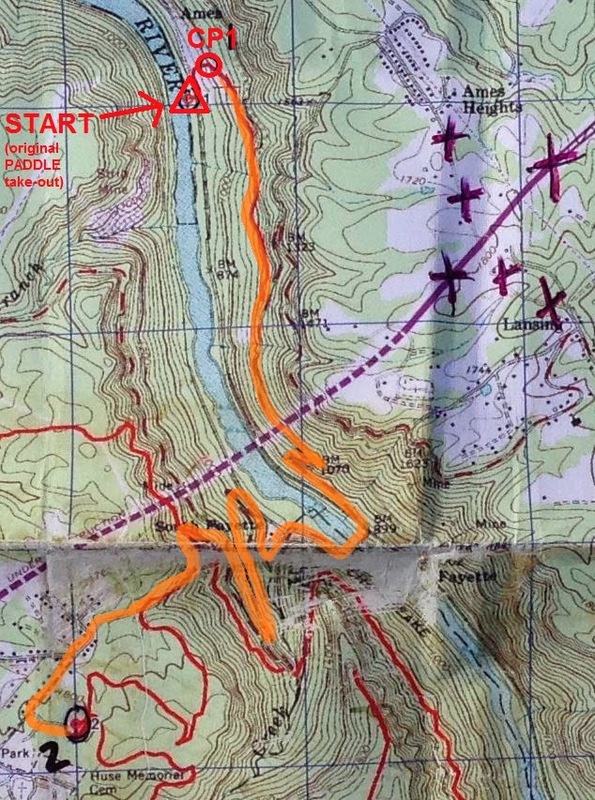 Of course it's the girls who are sent scrambling up the loose cliff, and after we write the code down (after some confusion), the Canadians continue up the power cut while we (Odyssey) and Rafael (Lone Wolf) continue to CP21. We love adventure racing! So does Rafael, he's in the background. One picture, three teams: The Canadians, Rafael, Odyssey. 1:24k USGS map. Our route from CP20 to HQ. Now that we've hit CP20, it's time for the real strategy to begin. We can collect the remaining 16 points in any order, either on foot or on bike. Our bikes are located at Race HQ/CP35 and are available to us at any time, but we also have to finish with them. Ronny's done a devlish job placing CPs - there is no obvious/best route back and we study the map for several minutes, determining which combinations are optimal. 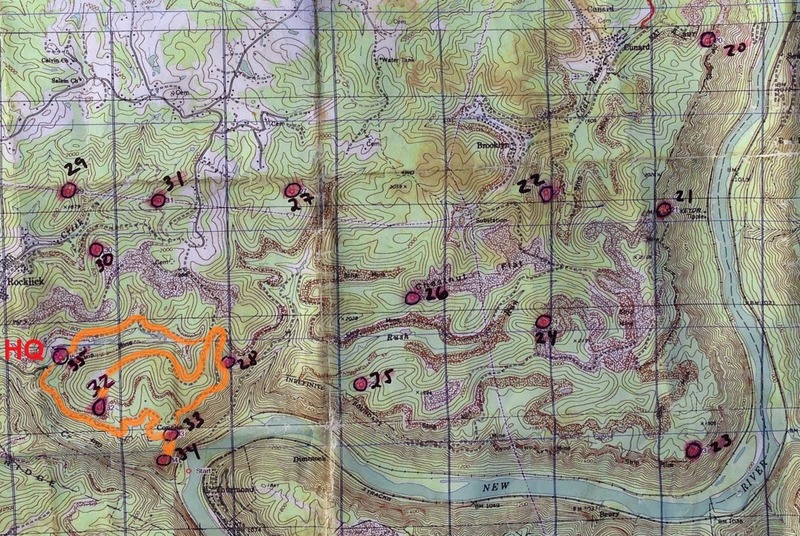 In addition to the USGS map, we have an ACE trail map which has a TON of trails marked on it. We decide to trek indirectly back to Race HQ and then pick up our bikes for the last few points. This means A LOT of time on foot, but like I said earlier, I'm thrilled about the chance to bash through the woods with my pack. We work hard to collect as many CPs in the daylight as we can. ACE property is a confusing place. There are trails everywhere, and while most of them are marked, some of them have developed around-routes to avoid huge mud holes, and some are so overgrown they're hardly visible. To top things off, there are some parts of ACE property that have been strip mined, forming vertical earthen "cliffs" that can be impossible to down/up climb. 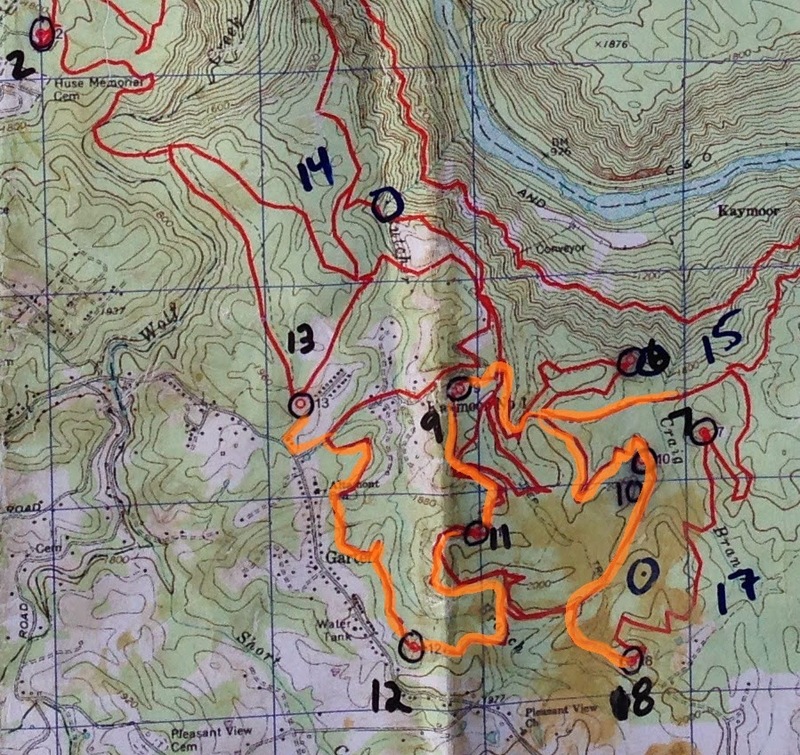 Of course those areas are best shown on the USGS map and not the ACE trail map. It takes a masterful navigator to assimilate all of this information run cleanly through this area, and Andy's doing a great job. We're being super careful with our route choices, and it seems to help quite a bit that Rafael is keeping our same pace, giving all of us the confidence of staying found. Night falls just before CP25, and we take a short break to put on lights and for Shane to change socks. Andy nails CP25 easily and then we make our way through the spiderweb of trails to CP27. We have a fairly obvious trail bend as an attack point, and we stride off into the briars confident that we're heading up the correct reentrant. Except, we can't find the punch. There are loads of other lights thrashing around the area, and it's so hard to tell if anyone else has found it. We have to relocate multiple times, first using the road to the NE and then the powerline to the S to re-attack. But then, success! There is nothing more satisfying than pinging a control flag after it's given you trouble. The next few controls are along the same powerline, so we trek along the powercut and cross our fingers it doesn't get too briar-y. I happen to be holding the USGS map at this point (Andy has been switching between them all night, and whoever's closer between me and Shane holds the other one) and have the itch to pull out my compass and help with the nav a little bit. Sure, these are about the easiest controls on the whole map because they have a HUGE handrail, but it's still fun to play navigator. Realities of overnight racing - not really seeing your teammates for 8-12 hours. Andy resumes navigational duties for CP30 and then back to HQ. Rafael is still with us and it's pretty awesome to see him doing so well. His navigation is solid! On the way back to HQ, we start seeing other teams and get word that TOG is finished. FINISHED! I'm not going to lie, it feels somewhat depressing to still have a TA plus 4 controls left at this point. We were hoping to be neck-and-neck with them for as long as possible, and now the gap is clearly going to be larger than we'd hoped. But the only way for us to enjoy a finish line is to keep trekking! So we do! We don't have too far to go until we're back at Race HQ. TOG is there, huddled by the fire, and we have a quick congratulatory chat with them as we transition onto our bikes for the last 4 points. USGS map of our final biking section. ACE map of the same thing. We bike out to CP33, punch that really easily, and then trek down to CP34 in our bike shoes. It requires a little creative footwork, but we make it and then climb back up to our bikes. We overshoot the attackpoint to CP28 just a bit, but Andy adjusts and uses a trail junction instead for another successful spike. Now we just have 1 more control left! And it's a toughie. We get to our hilltop easily enough (basically...go UP), but then have a really difficult time descending the spur to the correct trail. There seem to be a couple phantom trails in the area and none of us are processing that information very well right now. But we doggedly keep at it, and pretty soon Shane shouts that he's got the punch and we just have to ride home! On roads! Mostly downhill! We finish about 5am which is awesome. The sky is just starting the lighten up, and we've made it through the coldest part of the night without getting chilled. We have plenty of time to chat with Ronny and shower before breakfast is served at 7am. As we're walking to our cars, the door to the Sprinter van slides open and out pops Mark! He reports that he had surgery to remove the stick and is now on pain meds and antibiotics. The doctors wanted to keep him for a second overnight, but he somehow negotiated his early release and is eager to hear race stories. Of course we share them with him, and with the rest of the Wild Wonderful racers. It's a great finish line atmosphere, and especially because of the delicious pancake-and-eggs breakfast! Yum! Overall, I was SO GLAD I made the trip out to West Virginia to race with Odyssey. I have to admit I'm proud that I can add in a 24hr race with only a few days' notice and not freak out. My body and my mind are familiar with the challenges that overnight adventure racing brings, and every race is another chance to work on getting stronger. The Odyssey boys, Andy, Shane, and Mark, were excellent teammates and I really enjoyed tromping around the woods with them, all sticks aside! These three are also racing Untamed New England with Jen in June so you can be sure I'll be cheering them on!